When people hear about my weight-loss success following the #LCHF or #Banting diet they always ask about my missing carbs. The truth is I don’t miss them. What I miss is the freedom of just eating what I want to eat without thinking carefully about what’s in it. Recreational eating is where I struggle the most: there are times when, against my better judgement, I just want something to nosh. Not out of hunger but simply because that’s what I feel like at the time. Caesar’s Salad with chicken at Tasha’s. My go-to snack of choice are roasted, salted nuts. I manage to avoid peanuts which means that not only is it a costly collection of almonds, walnuts, cashews, Brazilians etc but I’m never satisfied with just a few at a time. When the nut hunger arrives it is usually only placated after eating far, far too many of them. 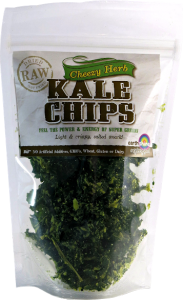 My friend Natalie Reid started a raw food business some years ago and was in touch about her Earthshine Kale Crisps. Kale, I’m sure you know, is a superfood and I use it as the basis for my green smoothie – kale, celery, broccoli, avocado and ginger which gets me going in more ways than one. A 35g bag of Kale Crisps has, according to Natalie, 250g kale which has been dehydrated. She’s added vegan flavouring to give it a cheesy taste which tastes just the way I remember Sour Cream and Chives Pringle chips tasting. 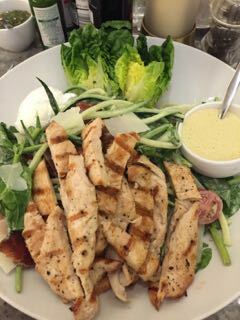 Although most restaurants nowadays offer low-carb items we frequently head to Tasha’s for the best, imho, Caesar Salad. I add chicken and leave the croutons and always ask for my poached egg to be soft. Pulp is another regular spot and I love their pesto chicken salad – I leave the carrots and tomatoes out and drench it in the supplied olive oil. On days when the psychological hunger needs to be fed, I order the HUGE Village Table Salad from Ocean Basket. This is one dish that takes me 30-minutes of active eating to finish and then I’m truly stuffed on the collection of olives, feta, cucumber, onions and tomatoes. At R70 it is brilliant value, in my opinion. 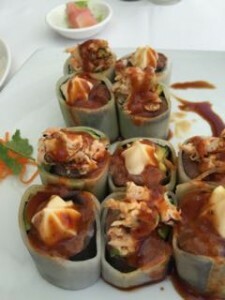 I was also thrilled to find Beluga still offering half-priced sushi – even the rice-free kind!